Technological innovation, attention to detail and constant quality control together with reliability and safety. 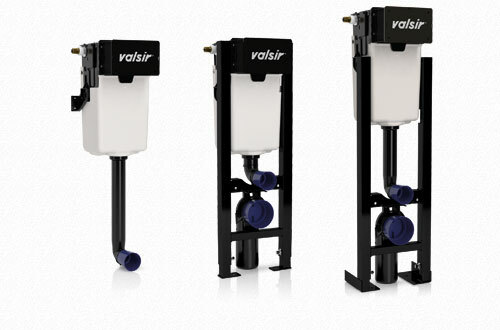 These cornerstones guide the design and production of Valsir cisterns. The experience gained by Valsir in the Triplus®, Silere® and PP3 soundproof waste systems allowed us to reach levels of excellence also in our flush systems. To the numerous advantages of Cubik S we also added silence. Cubik S, Winner S and Tropea S are the only cisterns in the world to be designed and produced to reduce noise during operation. Inside the Valsir Research and Development laboratories a special plastic compound was designed using a formula (exclusive to Valsir) with the aim of reducing the noise emissions from the flush cistern. In this way, the noise generated when the cistern container is being filled with water is significantly reduced. The internal components of Cubik S are certified according to ISO EN 3822 in silence class I both at 3 and at 5 bar by the prestigious TÜV LGA Institute in Nuremberg. The components have also been certified according to the French standard CSTB NF. The Valsir stop valve in technopolymer is the first on the market to have obtained the NF certification, with tests performed up to 50 bar. Cubik S, Winner S and Tropea S are today the only flush cisterns on the market to have a certified float valve and stop valve. The material of the container is designed to ensure high absorption of acoustic vibrations. The cistern is supplied 100% preassembled to improve installation speed and simplicity on the site. The rotating inlet fitting that can be positioned both on the right and left side, simplifies the installation of the cistern. Patented by Valsir, the flush valve guarantees the cleaning of all pan types, including rimless pans. The internal components of Cubik S are certified according to ISO EN 3822 and in compliance with the CSTB NF standard. The different plastic materials of the flush and float valve avoid the formation of limescale. Designed to be the most compact cistern on the market with a depth of just 300 mm. The plate can be positioned at the front, above or at a distance with mechanical, pneumatic or electronic activation. 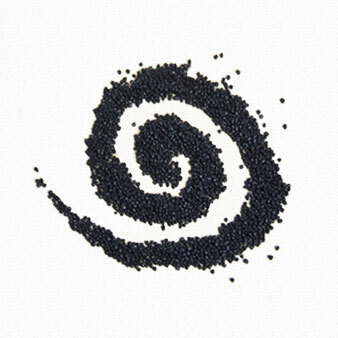 All rubber components comply with EN 681/WC, a guarantee of their unmatched quality and resistance to chemical agents. Flush regulation with Cubik S is extremely easy and can be set at 6/3, 4.5/3 fully in accordance to water saving philosophy and Green Building requirements. Made entirely of technopolymer and prefitted in the cistern to facilitate and accelerate installation operations; the system can be installed both to the right and left side and incorporates an accessible closing device. It is CSTB NF certified up to 50 bar. Designed and produced to guarantee maximum reliability in all situations, it resists water hammer as great as 30 bar. The internal accessible filter and the absence of a hose allow an easy maintenance and guarantee an excellent level of silence. It is certified in accordance with EN 14124. The resistance of its components to limescale, the self-regulation to the WC pans present on the market, and the blends of the seals that remain unchanged over time, make it the most reliable valve on the market, TÜV and CSTB NF certified. The device guarantees the perfect position and protection of the internal components during handling of the cistern until the control plate is installed. guarantee flexibility, speed and suitability to all types of walls and system requirements. This product is used for the installation of WC floor pans, with any type of wall. 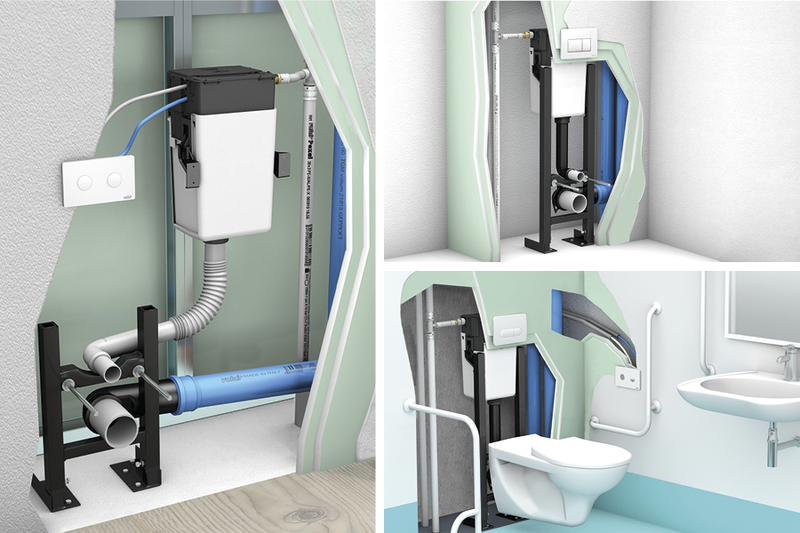 For the installation of wall-hung WC pans, Cubik S is supplied with the block frame. The Cubik S Block free-standing frame is made of painted steel and is used for the installation of wallhung WC pans with any type of wall. prefabrications and for all situations where space is extremely reduced. The Valsir range of flush cisterns meets the aesthetic requirements of the market thanks to the design and the refined materials of the push plates. As of 1st September 2012 the CE marking is required on all in-wall and external flush cisterns and it is an important instrument that defines the level of quality and reliability of the product. The CE mark states the parameters of product performance: durability, level of noise and volume of water discharged are some of the fundamental parameters. Cubik S not only has obtained the CE mark but It also has characteristics that meet the Green Building principles. The innovative reinforcement plate for Cubik S, made of painted steel, provides greater support to the sanitary appliances installed on light walls such as those in plasterboard. The plate was created to meet installation requirements when there is space remaining between the cistern and the plasterboard.